I haven’t had this much fun reading a book in ages. 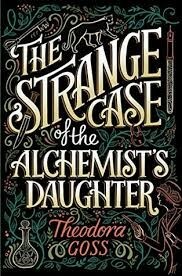 Theodora Goss’s “The Strange Case of the Alchemist’s Daughter” brings together a cast of characters that have been imagined and re-imagined from tales of fantasy, horror and mystery in a way that makes the reader feel like they have known them for ages, and wants to know more. The novel opens with Mary Jeckyll, alone and penniless after her mother’s descent into madness and subsequent death. Mary sets out on a search for Mr. Hyde, for whom a reward has been offered. Instead, she finds Hyde’s ragamuffin daughter, Diana. At the same time, Mary becomes embroiled with Sherlock Holmes and Dr. Watson, who are trying to solve the mystery of why dead prostitutes keep turning up. The cast of characters quickly becomes populated with Beatrice Rappaccini, Catherine Moreau, and Justine Frankenstein—all monsters in their own right, thanks to their scientist fathers. As the women get to know one another, their mutual affection deepens, as does the mystery of their connection—and their fathers’ connections. The novel is fast-paced, funny, and, above all, charming. Set in Victorian times, the backdrop is as bleak as one would expect, but the narrative is peppered with humor, including witty asides as the women interrupt the telling of the story as they see fit. This has the effect of making the reader feel as though she has just stepped into the living room of Mary Jeckyll for tea and conversation. I could hardly put it down. This book, while it centers around several gruesome murders, is not gruesome. The violence happens primarily off-stage (think Agatha Christie). And because of its rollicking, rocketing pace and its girl-powered core, it would be a great read for teens as well as adults.